How to Make Colourful, Recycled Gift Bows. This is a super easy craft project that you do in two parts. First you collect your foliage and set it pressing. 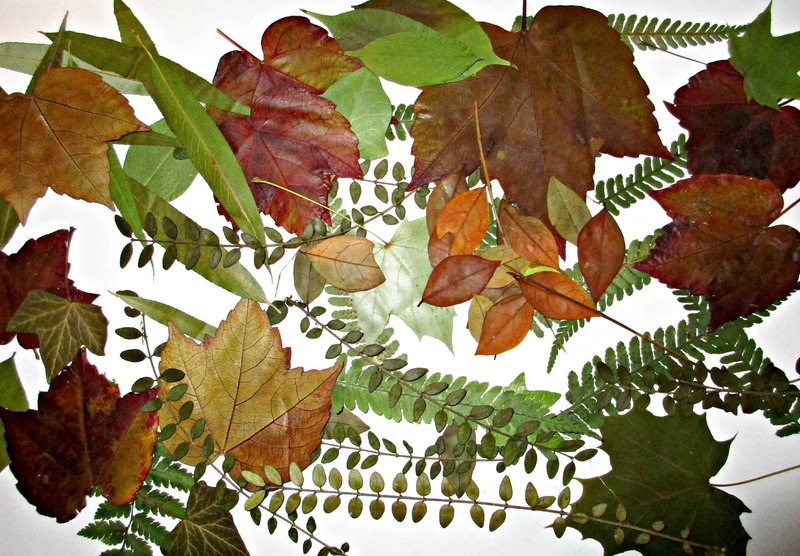 Then a couple of weeks later when your leaves are pressed, you can come back and use them in a craft project. Here we have used them to decorate some plain candles. 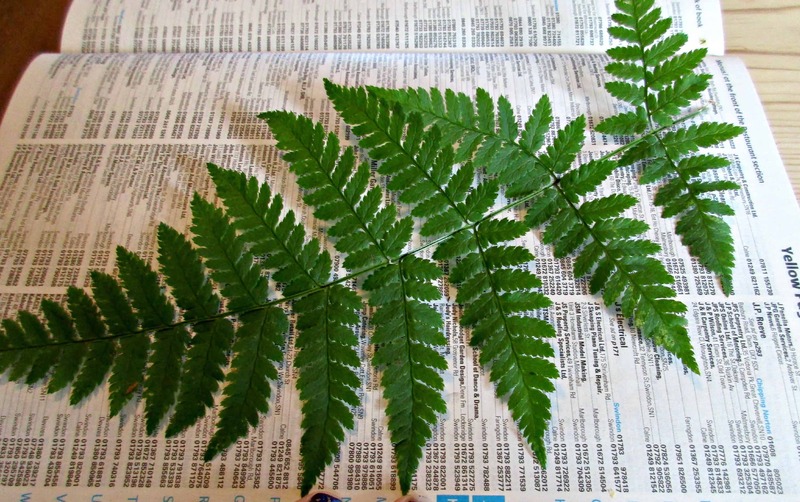 Collect some interesting leaves whilst you are out and about – we visited a local woods to collect ours. The leaves wont stick if they are dry, so if you need to, lay them on kitchen towel to absorb any moisture. We used a telephone directory to press our leaves in. The finish of the paper allows for any moisture to be absorbed, plus as we no longer use ours, it’s a great way to make use of something that normally ends up in the recycling bin! Set your leaves out carefully so that they are not touching each other, and leave half a dozen pages between each set of leaves. Then pile half a dozen heavy books on top of your leaf-filled directory, and forget about it for a couple of weeks! We left our leaves for about 3 weeks, until a rainy afternoon prompted an indoor craft project. We found that the green leaves that we had pressed stayed pretty much at their original colour, but the leaves that were showing autumn colours had continued to darken up. To attach the leaves to the candles is a really simply process. You are aiming to soften the surface of the wax just enough to adhere the leaves to it. Using a cup full of boiling water for each of us, we dropped a couple of spoons into each. We positioned our leaves, then covered them with a piece of grease-proof paper. 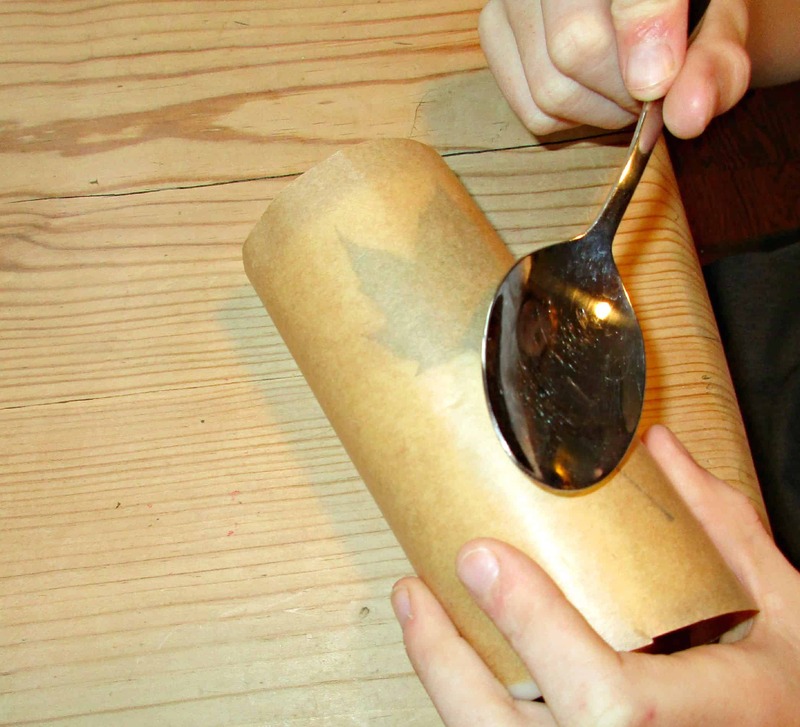 Then we applied the back of our hot spoons to the leaves through the paper. We found that holding the spoon in one area for about 10 secs before moving it, was what it took to get the leaves to adhere well. As the spoon starts to cool down, simply drop it back into the water, and use the other whilst the first reheats. Once you can no longer lift the edges of the leaf it is well stuck and you can move onto your next leaf. We think this is a great way to up-cycle a plain, inexpensive candle, and would make a lovely little gift for someone. If you are looking for some more inspiration for crafting with nature. please check out our decoupage with leaves tutorial, and our simple willow wreath. If you are looking for activities to do with kids while out on a walk, why not try bark rubbing, making a wild obstacle course of making some wild art! Sarah is the founder and author of Craft Invaders. She blogs about her original craft tutorials, recipes, foraging, the Cotswolds, and developing well-being through being creative, spending time outdoors and connecting with nature. She is also proud to be an Ordnance Survey #GetOutside Champion. Sarah, this is a really great project to do with the kids. First they get a fun day outside collecting what they find really pretty to press for the candles, and then they get to create a one of a kind candle with their findings. This is the perfect time of year to do this. A walk in the fall woods and they can make a gift for their teachers, or grandparents or care-givers. Really cool idea. One the kids can really take ownership and be proud of. Pinning! Thanks Nikki, It is a great project that anyone can do, and can easily be broken down into stages. It occurred to me that it’d look great with skeleton leaves, so we will try that out next. There are actually tutorials on pinterest to make your own skeleton leaves, which is on our ever growing list of things to try! These are so beautiful Sarah. They look so much nicer than the store bought ones. Thank you for sharing your tips on how to make them. I’m going to pin this one. 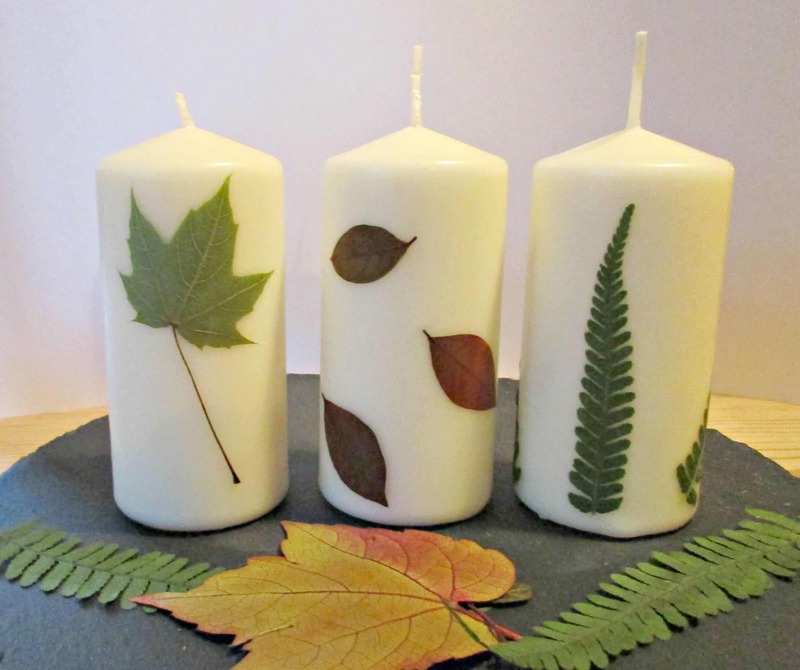 Thank you for your kind comments Mary 🙂 They are a lovely simple craft – one of the candles is heading into school to be used as their worship candle in assembly, so the kids are delighted. Just been admiring your Chalkboard Fall Vignette on your site – its so cute, in the name of craft I will endeavour to empty a bottle or two so I can try something similar here 🙂 ps I had to google ‘boondocks’ – what a great word! What a great idea – and very autumnal too! It’s a great way to get children involved in the changing seasons too! This is an excellent idea, I love new ideas to collect up and use leaves for this. It seems fairly easy but effective, I love it! We’ll definitely have to try this! A great craft activity and just the right time of year to be running around catching falling leaves too. Thanks for joining country Kids and don’t forget to link to Trash 2 Treasure with this lovely tutorial too. Wonderful idea! Perfect for autumn. Look forward to trying this – thank you! Lovely idea and would make such a nice gift. Craft Invaders is a participant in the Amazon Associates Program. As an Amazon Associate I earn from qualifying purchases. All affiliate links in posts will be clearly marked. You can read more on our use of affiliate links here.